You can stay in a suite on the Las Vegas Strip with amazing views of snow-topped mountains and rust-red desert landscapes, but did you know can actually be on those peaks and in those valleys in less time than it takes to wait in a nightclub’s general admission line? So, if a night out in Vegas leaves you in need of a spiritual recharge, here are seven things to do in Las Vegas within an hour of The Strip that’ll get you back to nature and ready for another round (or several). An indoor-outdoor cultural history museum that’s more than just an awesome place for a school-kid’s field trip, the 180-acre Springs Preserve has rocks, bones, hydrology and solar technology on display—everything you need to understand how humans and wooly mammoths at some point decided to live in the middle of the Mojave Desert. Or find your peace on a stroll through 8 acres of award-winning botanical gardens. It’s kind of hard to believe all of this exists just a couple freeway exits from Downtown. Coming soon for cosplay kicks: Boomtown 1905, a throwback to the year before Las Vegas became a real city. A little further out of town but still close by, the Clark County Wetlands Park provides 2,900 acres of lush habitat for hundreds of plant and animal species in the Las Vegas Wash—essentially, the last stop for the Vegas Valley’s wastewater and drainage before it trickles down to Lake Mead. It’s an ideal place to come for an hour or so just to listen to the soothing sounds of water flowing through rocks, or for winter migratory bird watching. Looking for more active pursuits? Hiking, cycling and horseback riding are also options in parts of the park. A favorite local destination for skiers and snowboarders, Mount Charleston also offers year-round hiking amid majestic limestone cliffs with panoramic views that span from California to Utah. Mount Charleston also happens to be an independent ecosystem, like the Galapagos, where certain species have evolved atop the mountain but can’t migrate down without facing extinction. The little blue butterflies that live here are endangered, so enjoy seeing something you’ll never see anywhere else—and don’t even think about taking one home to pin to a board. Located about 45 miles northeast of Las Vegas, Valley of Fire is a slightly longer drive away than Red Rock, but it also gets far less crowded. Set in a 6-by-4-mile basin in the Mojave Desert, this Mars-like landscape (it was used for extra-planetary location shoots in the 1990 version of Total Recall) is the oldest state park in Nevada and has been 150 million years in the making. It’s notably also home to ancient petroglyphs, or as you might know them, prehistoric emoji. For more serious hikers, Goldstrike Canyon—just 45 minutes away from the Las Vegas Strip in the Lake Mead National Recreation Area—offers desert beauty at the slight risk of mortal injury. Hikers descend down a series of cascading geothermal pools speckling a four-mile hike downstream from Hoover Dam. At the end are uber-clear pools and both hot and cool springs amid caves and waterfalls. The best time to go is December through March, to avoid dangerous heat. Be careful, though—signs near some of the springs warn you to keep your head above water, lest you give a brain-eating amoeba entryway into the slot-canyon of your ear canal. Of all the destinations on this list, this one is unique in that it a) is manmade, and b) won’t be around forever. 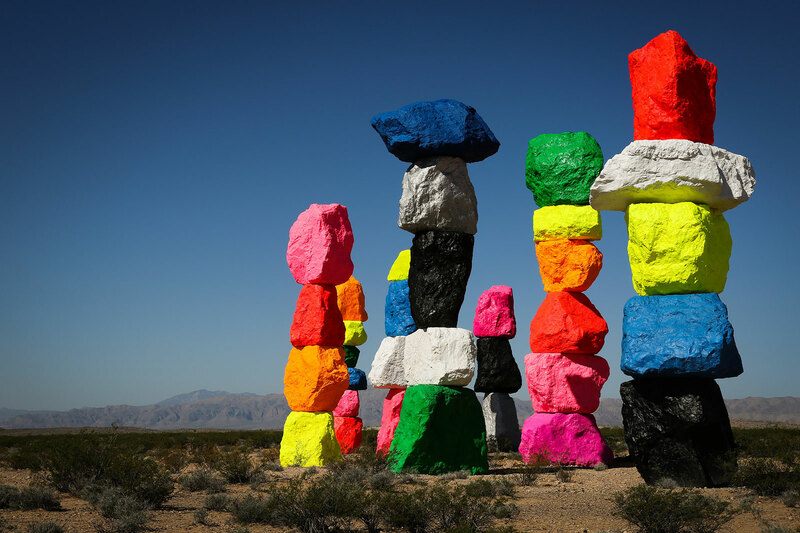 Swiss artist Ugo Rondinone assembled seven massive rock totem poles, stacked 30-to-35-feet high, in day-glow color mixes, placed in an expanse of general nothingness just some 10 miles south of the Las Vegas Valley. Seven Magic Mountains is set to disappear in less than two years, with no plans to convert into snow globes for sale at the airport, so marvel at it while you can. Start Discussion *If you go to LV and not see Valley of Fire about 45 miles away, you are missing alot. Just avoid hiking there from early July to early September to avoid hot days. Not one word about lake mead. One of the coolest places to party. Naturally you’ll need a boat. Sandy is cool. Go through the narrows and head out to Long Beach. If the wind is right, you’ll see about 50 boats beached up. Usually some real Vegas baby dolls, thin, tan with big racks. Start Discussion *downtown container park!!! Well, I’d never call Vegas “boring,” but fair enough — it’s not for everyone. Hope you found your happy place in L.A.
Go to the Meetup.com to find a hiking group organized by an experienced guide (typically no charge). You’ll go on unmarked trails, some rated 4 where you may need rope assistance or a harrowing tip toe finger hold around a ledge with an 80 foot drop. These views beat ANY of the marked trails. Valley of Fire is amazing!